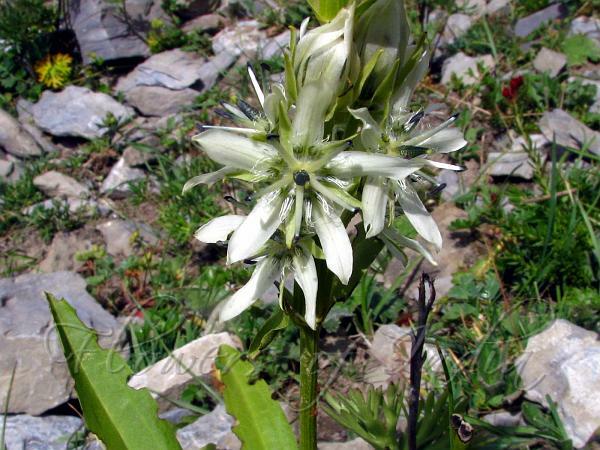 Stalked-Leaf Swertia is a flower similar to Showy Swertia with lurid gray or nearly white flowers with blue -green veins, but flowers smaller, and seeds not winged. Flowers are borne in lax spike-like terminal cluster. Petals are narrow-elliptic, about 1 cm long, iwth 1 or 2 basal lanceolate acute fringed nectaries. Basal leaves are lanceshaped, long-stalked and clasping the stem as base. 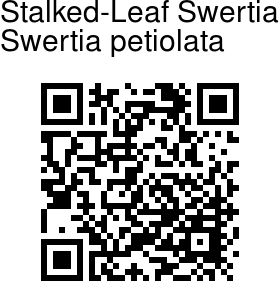 Uppermost leaves are narrow-lanceshaped, pointed, stalkless. Stem is erect, usually 20-60 cm. Stalked-Leaf Swertia is found in the Himalayas, from Afghanistan to W Nepal and SE Tibet, at altitudes of 3300-4500 m. Flowering: July-August. Photographed enroute to Panjtarni, Amarnath Yatra Route.